Oh, this list can go on forever, but I’ll try to fill in the blanks little by little, each time with a new list of goodies. I have fun at Trader Joe’s. I have fun at supermarkets period. At farmer’s markets. At Costco. At foreign supermarkets, outdoor markets, little food stores. Seeing food on display, deciding what you want, imagining recipes, discovering new products, sampling, happy to see the season’s new crops…I love all of that. It’s my idea of a good time. 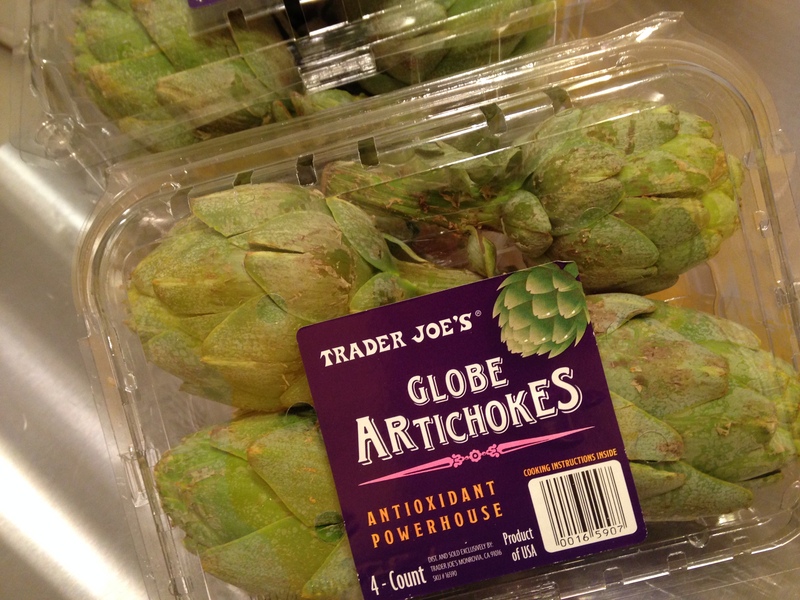 I am an artichoke junkie. I love the Italian word for artichokes: carciofi. Finding fresh ones, consistently, that aren’t the size of tractor trailers, that are human-sized, that you can cook up in the many ways I love to cook them (here’s one recipe), is sometimes the equivalent of obtaining the Holy Grail (yes, I exaggerate). But these are gold-like to me. And TJ’s is the only place where the packages are stacked high and easy to buy. I grew up eating them “Italian-style” then shared an apartment on LI with a California friend (hello, Castroville, CA, American capital of artichoke growing) and learned her way of eating them and then we came up with a recipe we both adored: boil or steam them till the heart is tender. Make a dip of mayo, lemon juice and soy sauce. Umami-central. Trader Joe’s has 3 different olives that I love. Picholine is one of them. Perfect acidity, soft but al dente, goes with ANYTHING. 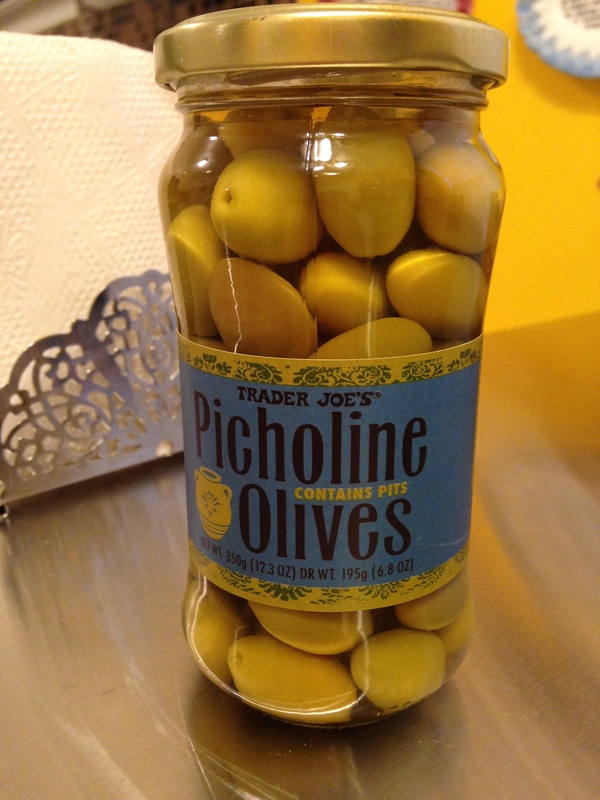 My other favs are their pitted Kalamata and the green Jaques Lucques olives–oh, yum. These are in the freezer section. Raw, shelled. And are not always available. They SELL OUT. 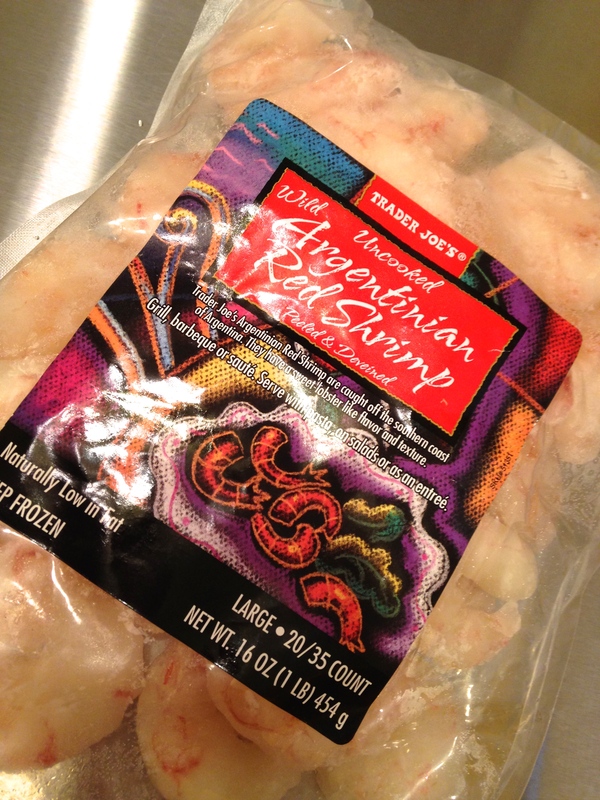 Something unusual about this shrimp. They are pink while raw, and they are soft when cooked. It’s an odd, pleasant, and luxurious sensation to bite into one, like you’ve been invited to the high gourmand table. This product is a boon to mankind. How often do you run across fresh fava beans? I do, sometimes. Sometimes in the regular supermarket. More often in the Asian market. But not always. THESE are out of their pods, but still in their individual shells. I just discovered them in TJ’s freezer section last month. LOVE. 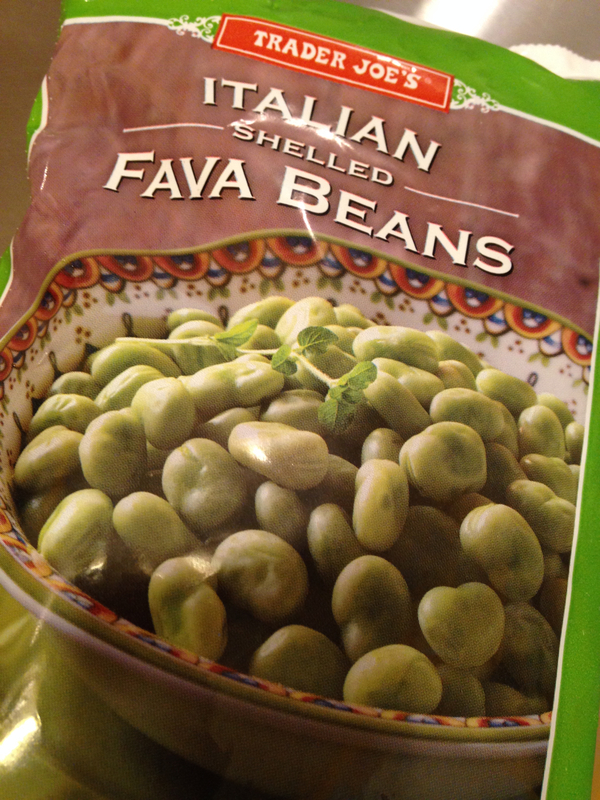 I give them a quick blanche, then peel each shell away to reveal that startling green lovely, so lovely, fava bean. My fav recipe: Sauté some sliced onion and diced pancetta in some olive oil. Add beans, add a bit of wine. Cook for just 5 minutes or so (TJ’s are young beans, so don’t need to cook too long). Add some salt. LOVE this. So when I usually buy walnuts they are whole. Supposedly, that’s preferred. If you’re snacking on them I’m sure that whole is more satisfying. But if you’re cooking, I end up breaking them between my fingers (since on a board with a knife they tend to have a flight life all their own). Trader Joe’s sells them broken. TJ’s nut department– no, not the employees — nor the shoppers — but the nuts as in walnuts, pecans, pine nuts, cashews, peanuts, almonds is EXTENSIVE. It’s a pleasure just to peruse the shelves and marvel at the variety. 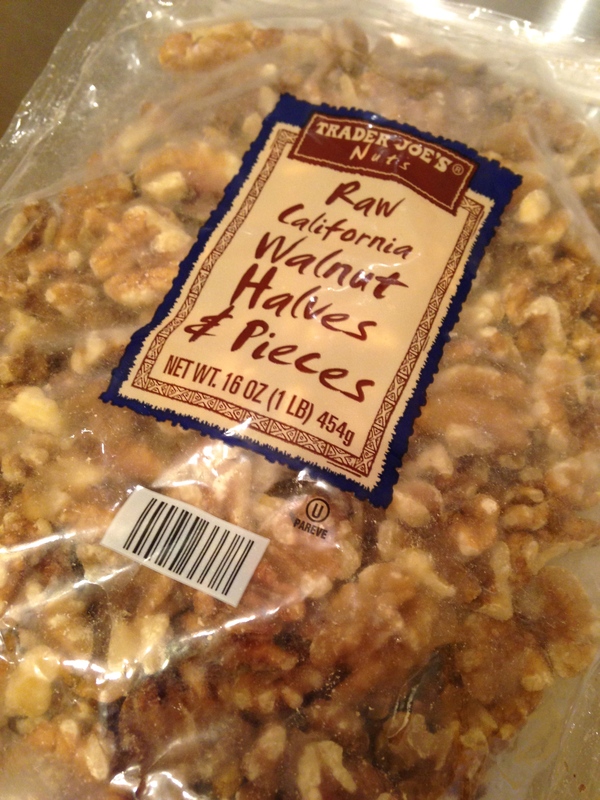 Yes, you can get whole walnuts, but I like these broken ones…ready to go. Same with pecans, whole or broken, candied or salted, raw or roasted. And the list goes on…leaving an irresistible trail for you to follow …nibbling all the way. I love this package. And I love this cocoa. What more could you want? 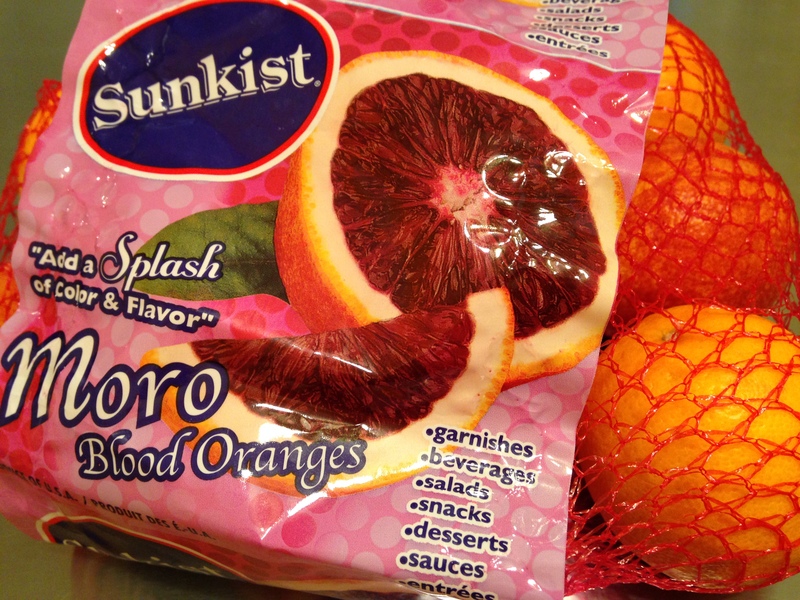 I almost fainted when I saw this bag of blood oranges at Trader Joe’s this past January. They’re a rare commodity. They aren’t there now. But you never know. 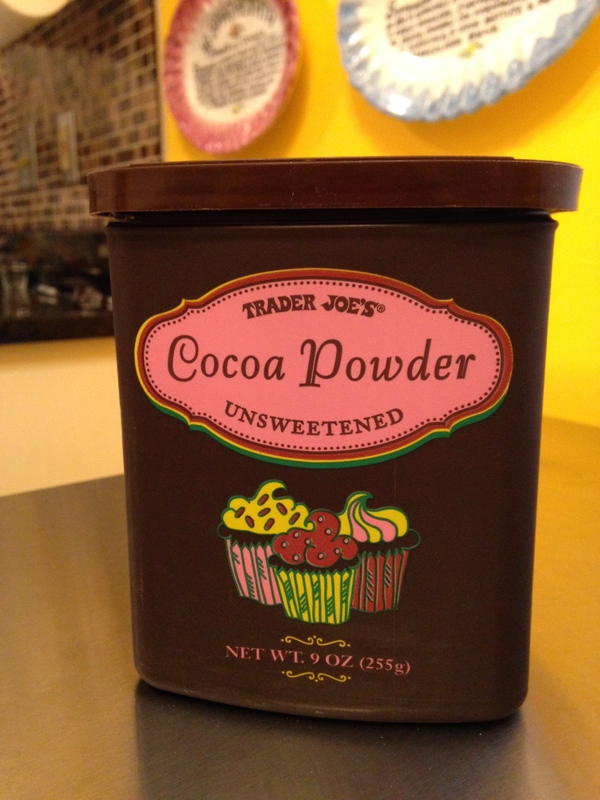 And that’s the thing about Trader Joe’s. They come up with seasonal stuff. (Like a 2-foot branch of Brussels sprouts. And their burnt-around-the edges-but yummy matzoh crackers only in around Passover.) And then it’s gone. Grab it when you can. 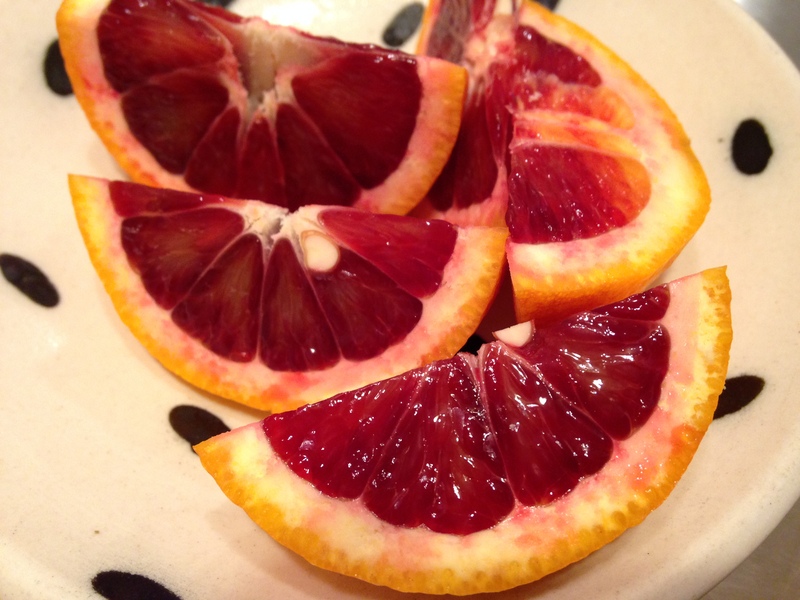 These blood oranges are so delicious, not as sweet as “orange” oranges, but the tartness elevates the flavor. They’re so pretty and remind me of my student days in Rome. My other fav TJ’s orange is the Cara Cara. A lot of people are running away from white foods. White bread, white potatoes, white rice…white flour in general. But not white cauliflower. Oh, that smooth head of tight-woven flowerets. There’s something satisfying about even holding a cauliflower. It has some nice heft to it. 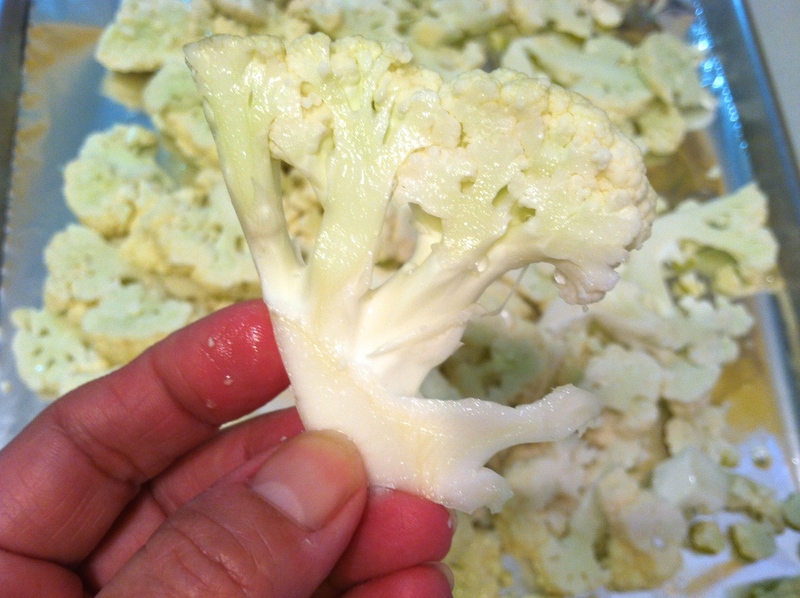 It’s got those thick real-farm-feel leaves (even tho we cut them out and throw them away)…cauliflower just feels important. When you pick it up from the produce shelf in the supermarket you’re ticking off another check in the healthy food column of your diet. You kinda pat yourself on the back for choosing it. And yes, you should! Cauliflower has: carotenoids, B1, B2, B3, B5, B6, B9, omega-3, vitamin K, its anti-inflammatory, detoxifies, and studies call it a disease-preventing food. Years ago, I used to steam florets and then pour something creamy or buttery on top. Now I’m hooked on roasting it. 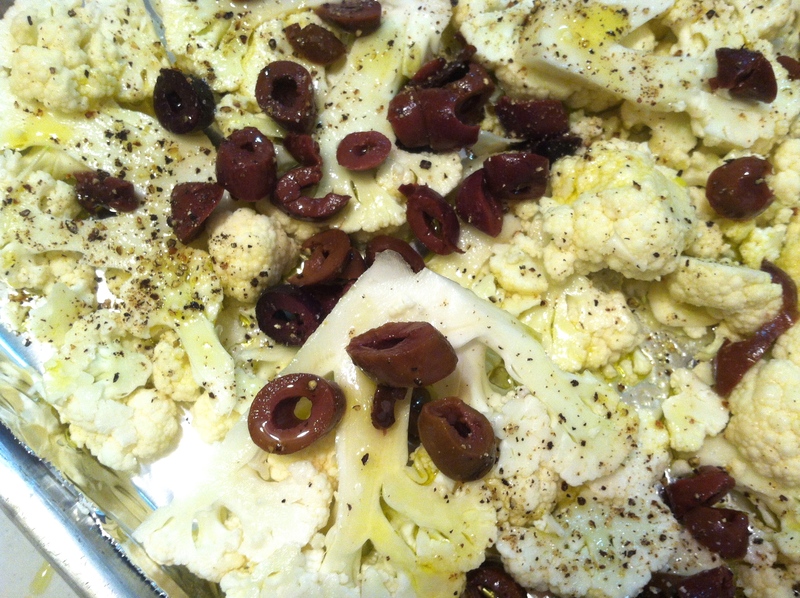 And adding olives. And olive oil. And salt & pepper. And that’s it. But my favorite part is how I cut it. After removing the impressive stems and leaves, I cut the head in half, then in quarters. I make slices of each quarter as thin as I can. Each slice looks like a cross-section of cauliflower. Like some scientific study in cauliflower anatomy. 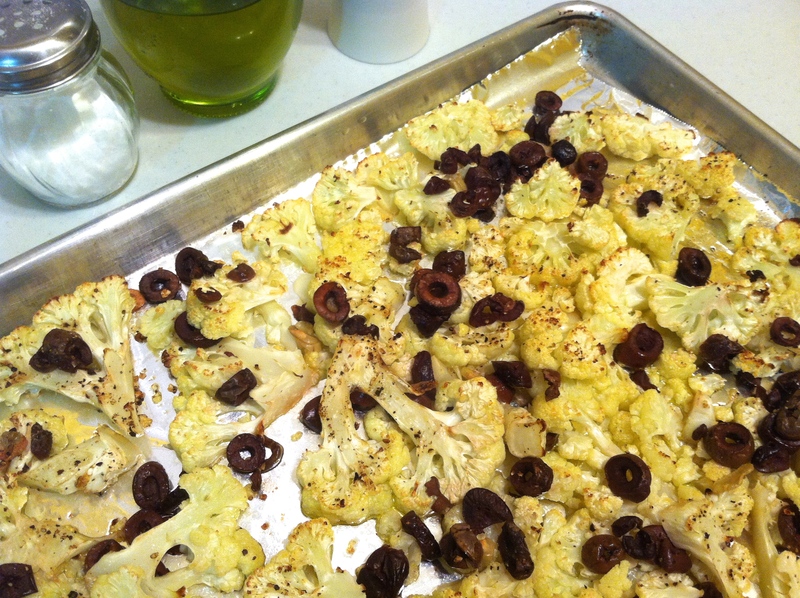 Lay the slices out on a foil-lined, lightly oiled sheet pan. 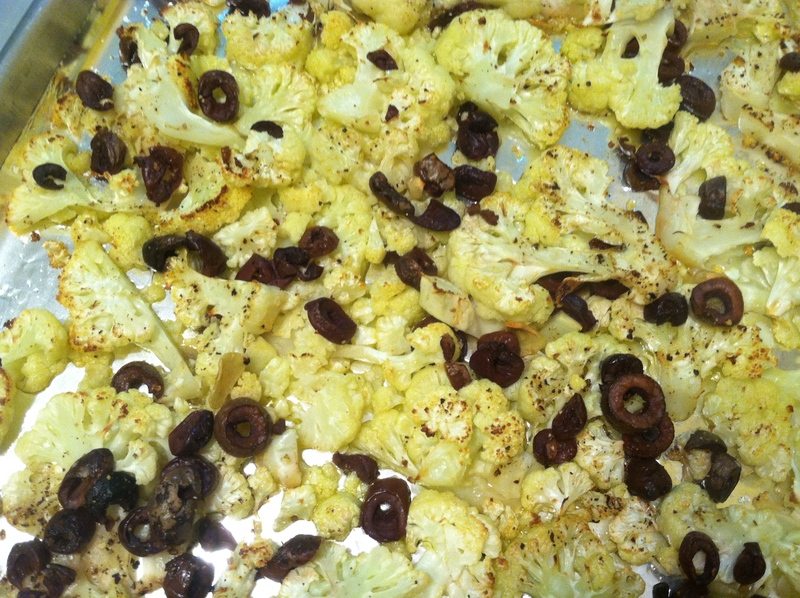 sprinkle olives (I often use sliced kalamata), drizzle with olive oil and sprinkle salt & pepper generously. Roast in 400-degree oven for about 20 minutes until tender. Leave in longer and get some browning going. Check out my cooking segment from yesterday’s Channel 4 More at Midday. 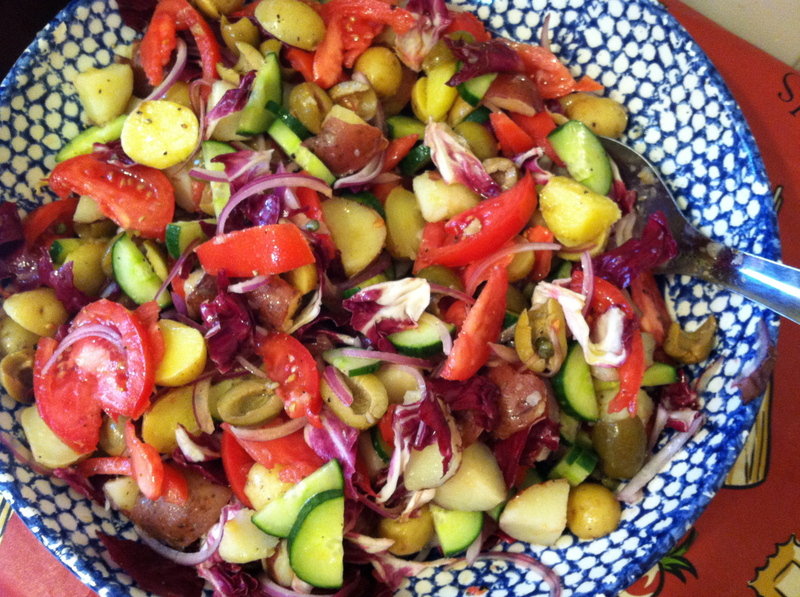 A great way to perk up potatoes with the tastes of the Mediterranean! Boil potatoes until tender but still a bit firm. Cut into bite-sized pieces. Toss with tomatoes, onion, olives, cucumber, pepper, and capers. 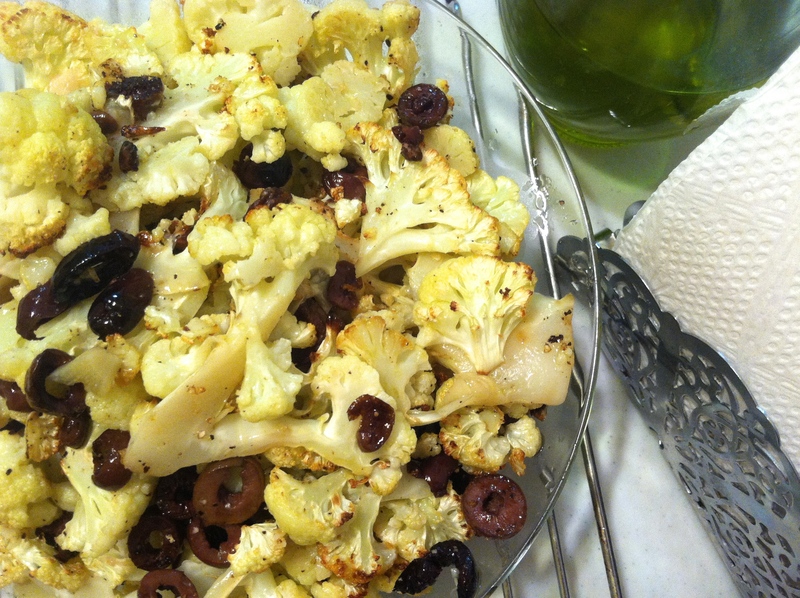 Drizzle with olive oil & vinegar. Season well with salt & pepper. Toss to combine.